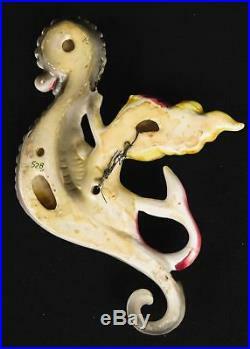 VTG Lefton 528 Blonde Mermaid Riding Seahorse Wall Hanging Plaque Bathroom. 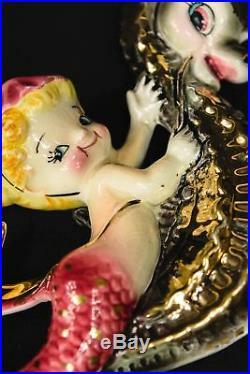 This is a mermaid wall plaque from Lefton. Measures 6" tall and 4.5" wide. There are very minor marks in the glaze as well as light crazing. It looks like someone had previously glued this to their wall. There is some glue residue on the back. 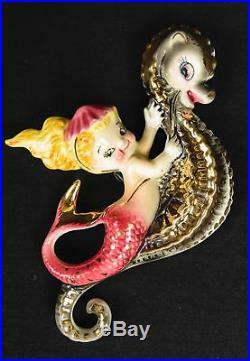 The item "VTG Lefton 528 Blonde Mermaid Riding Seahorse Wall Hanging Plaque Bathroom" is in sale since Tuesday, August 01, 2017. This item is in the category "Collectibles\Decorative Collectibles\Decorative Collectible Brands\Lefton Figurines". The seller is "shopcrownhouse" and is located in Millersburg, Pennsylvania. This item can be shipped to United States, Canada, United Kingdom, China, Mexico, Germany, Japan, France, Australia, Russian federation, Denmark, Romania, Slovakia, Bulgaria, Czech republic, Finland, Hungary, Latvia, Lithuania, Malta, Estonia, Greece, Portugal, Cyprus, Slovenia, Sweden, South Korea, Indonesia, Taiwan, Thailand, Belgium, Hong Kong, Ireland, Netherlands, Poland, Spain, Austria, Israel, New Zealand, Philippines, Singapore, Switzerland, Norway, Saudi arabia, Ukraine, United arab emirates, Qatar, Kuwait, Bahrain, Croatia, Malaysia, Chile, Colombia, Costa rica, Dominican republic, Panama, Trinidad and tobago, Guatemala, El salvador, Honduras, Jamaica, Antigua and barbuda, Aruba, Belize, Dominica, Grenada, Saint kitts and nevis, Saint lucia, Montserrat, Turks and caicos islands, Barbados, Bangladesh, Bermuda, Brunei darussalam, Bolivia, Ecuador, Egypt, French guiana, Guernsey, Gibraltar, Guadeloupe, Iceland, Jersey, Jordan, Cambodia, Cayman islands, Liechtenstein, Sri lanka, Luxembourg, Monaco, Macao, Martinique, Maldives, Nicaragua, Oman, Pakistan, Paraguay, Reunion.